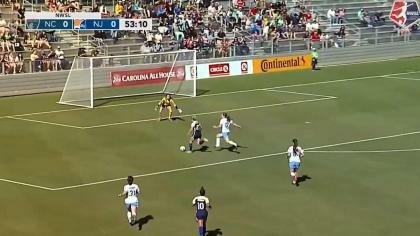 Rookie forward Mallory Pugh scored the game-winning goal in the 85th minute after Whitney Church equalized in the 75th minute as the Washington Spirit came from behind to beat Sky Blue FC 2-1on Sunday night. With the result, Sky Blue FC (9-11-2, 29 points) has been eliminated from playoff contention. They needed a win to keep their playoff hopes alive. Washington moves into ninth place with a 5-13-4 record and 19 points. Pugh broke the 1-1 deadlock with her fourth goal of the season. Lindsay Agnew earned her first NWSL assist on the play. Pugh did not start the match and was listed as probable with a right hip flexor strain. She entered in the 62 minute and scored with her only shot of the match. Church tied the game in the 75th minute when she headed in a corner kick from Shelina Zadorsky. It’s the first goal of the season for Church and the first assist of the season for Zadorsky. Spirit goalkeeper DiDi Haracic made seven saves in the win. Sky Blue FC took 21 total shots, but Haracic kept her team in the match. In the 33rd minute, she turned away a close header by Hayes. And then in the game’s final minutes, with Sky Blue desperate to turn around the result, she made back-to-back saves vs. Kelley O’Hara and Daphne Corboz. Church also came up big in the sequence, blocking a shot from O’Hara after Haracic’s first save. Forward Maya Hayes scored in the 43rd minute to give Sky Blue the 1-0 lead. Sam Kerr sent a pass to Hayes in the box and Hayes collided with Haracic. With the goalkeeper still on the ground, the ball bounced lose in the box — off Kerr and several Spirit defenders. Hayes got to her feet and scored. Haracic remained down on the play, but stayed in the game. Kerr came into the game in search of her record-breaking 17th goal this season, but could not get on the scoresheet. She’ll get her next shot at the record on September 24 when Sky Blue hosts the North Carolina Courage. The Spirit will next be in action on September 23 when they host the Breakers. Match ends, Sky Blue 1, Washington Spirit 2. Second Half ends, Sky Blue 1, Washington Spirit 2. Attempt saved. Kelley O'Hara (Sky Blue) left footed shot from the right side of the box is saved in the bottom right corner. Attempt saved. Daphne Corboz (Sky Blue) right footed shot from the centre of the box is saved in the top right corner. Assisted by Kelley O'Hara. Attempt blocked. Kelley O'Hara (Sky Blue) right footed shot from the centre of the box is blocked. Assisted by Samantha Kerr. Offside, Sky Blue. Daphne Corboz tries a through ball, but Samantha Kerr is caught offside. Offside, Sky Blue. Sarah Killion tries a through ball, but Kelley O'Hara is caught offside. Offside, Sky Blue. Raquel Rodríguez tries a through ball, but Kelley O'Hara is caught offside. Corner, Sky Blue. Conceded by Whitney Church. Substitution, Washington Spirit. Tori Huster replaces Lindsay Agnew. Goal! Sky Blue 1, Washington Spirit 2. Mallory Pugh (Washington Spirit) right footed shot from outside the box to the bottom left corner. Assisted by Lindsay Agnew. Attempt blocked. Alyssa Kleiner (Washington Spirit) right footed shot from the centre of the box is blocked. Assisted by Meggie Dougherty Howard. Attempt missed. Samantha Kerr (Sky Blue) left footed shot from the centre of the box is close, but misses to the right. Substitution, Sky Blue. Raquel Rodríguez replaces Madison Tiernan. Goal! 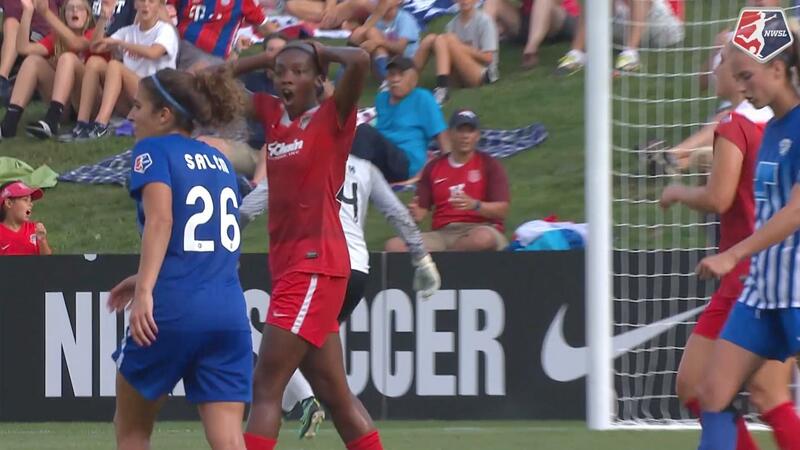 Sky Blue 1, Washington Spirit 1. Whitney Church (Washington Spirit) header from the centre of the box to the top left corner. Assisted by Shelina Zadorsky with a cross following a corner. Corner, Washington Spirit. Conceded by Kelley O'Hara. Substitution, Washington Spirit. Cali Farquharson replaces Cheyna Williams. Attempt saved. Cheyna Williams (Washington Spirit) left footed shot from a difficult angle on the left is saved in the bottom left corner. Assisted by Meggie Dougherty Howard with a through ball. Attempt missed. Samantha Kerr (Sky Blue) right footed shot from the right side of the box misses to the left. Assisted by Madison Tiernan with a headed pass. Attempt missed. Morgan Proffitt (Washington Spirit) right footed shot from outside the box misses to the left. Assisted by Meggie Dougherty Howard. Substitution, Sky Blue. Daphne Corboz replaces Maya Hayes. Substitution, Washington Spirit. Mallory Pugh replaces Havana Solaun. Attempt missed. Lindsay Agnew (Washington Spirit) right footed shot from outside the box misses to the right. Assisted by Meggie Dougherty Howard. Corner, Washington Spirit. Conceded by Nikki Stanton. Attempt blocked. Cheyna Williams (Washington Spirit) left footed shot from the centre of the box is blocked. Assisted by Caprice Dydasco with a cross. Attempt missed. Samantha Kerr (Sky Blue) right footed shot from a difficult angle on the right is close, but misses to the right. Assisted by Madison Tiernan. Offside, Washington Spirit. Havana Solaun tries a through ball, but Cheyna Williams is caught offside. Attempt missed. Samantha Kerr (Sky Blue) right footed shot from outside the box is high and wide to the right. Assisted by Taylor Lytle. Attempt blocked. Taylor Lytle (Sky Blue) right footed shot from outside the box is blocked. Assisted by Madison Tiernan. Foul by Kassey Kallman (Washington Spirit). Attempt blocked. 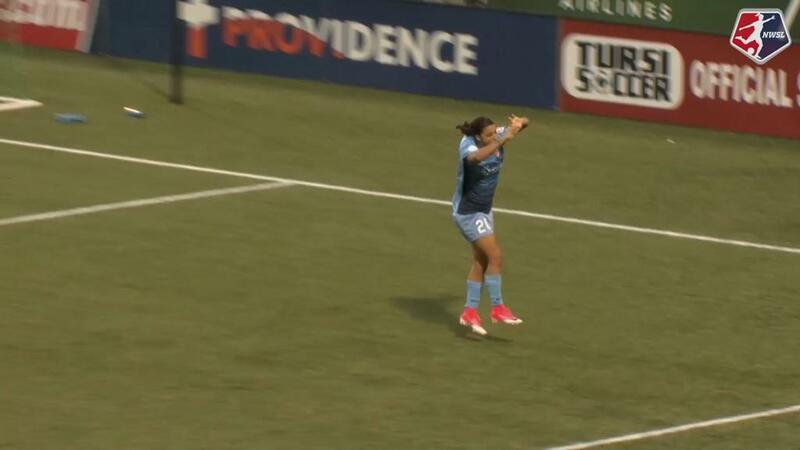 Kelley O'Hara (Sky Blue) right footed shot from outside the box is blocked. Assisted by Taylor Lytle. Attempt missed. Madison Tiernan (Sky Blue) left footed shot from outside the box is close, but misses the top left corner. Attempt missed. Sarah Killion (Sky Blue) header from the centre of the box is close, but misses to the right. Assisted by Taylor Lytle with a cross. Attempt missed. Alyssa Kleiner (Washington Spirit) right footed shot from outside the box is close, but misses to the right. Assisted by Cheyna Williams. Attempt blocked. Cheyna Williams (Washington Spirit) right footed shot from the right side of the box is blocked. Assisted by Lindsay Agnew. Second Half begins Sky Blue 1, Washington Spirit 0. First Half ends, Sky Blue 1, Washington Spirit 0. Attempt blocked. Cheyna Williams (Washington Spirit) left footed shot from the centre of the box is blocked. Assisted by Morgan Proffitt. Attempt blocked. Cheyna Williams (Washington Spirit) left footed shot from a difficult angle on the left is blocked. Assisted by Alyssa Kleiner with a headed pass. Delay in match DiDi Haracic (Washington Spirit) because of an injury. Goal! Sky Blue 1, Washington Spirit 0. Maya Hayes (Sky Blue) left footed shot from the centre of the box to the top left corner. Attempt blocked. Samantha Kerr (Sky Blue) left footed shot from the centre of the box is blocked. Assisted by Maya Hayes. Attempt saved. Samantha Kerr (Sky Blue) left footed shot from a difficult angle on the right is saved in the centre of the goal. Assisted by Erica Skroski with a through ball. Attempt missed. Madison Tiernan (Sky Blue) header from the centre of the box misses to the left. Assisted by Taylor Lytle with a cross. Attempt saved. Sarah Killion (Sky Blue) right footed shot from the centre of the box is saved in the bottom left corner. Assisted by Taylor Lytle. Offside, Sky Blue. Erica Skroski tries a through ball, but Samantha Kerr is caught offside. Attempt missed. Samantha Kerr (Sky Blue) header from the centre of the box is close, but misses to the left. Assisted by Nikki Stanton with a cross following a corner. Corner, Sky Blue. Conceded by DiDi Haracic. Attempt saved. Maya Hayes (Sky Blue) header from the centre of the box is saved in the bottom right corner. Erica Skroski (Sky Blue) wins a free kick in the attacking half. Attempt saved. Lindsay Agnew (Washington Spirit) right footed shot from outside the box is saved in the centre of the goal. Assisted by Caprice Dydasco. Attempt blocked. Havana Solaun (Washington Spirit) right footed shot from outside the box is blocked. Cheyna Williams (Washington Spirit) wins a free kick in the attacking half. Foul by Dominique Richardson (Sky Blue). Attempt saved. Havana Solaun (Washington Spirit) right footed shot from outside the box is saved in the centre of the goal. Meggie Dougherty Howard (Washington Spirit) wins a free kick in the attacking half. Attempt missed. Meggie Dougherty Howard (Washington Spirit) left footed shot from outside the box is close, but misses to the left. Assisted by Lindsay Agnew. Whitney Church (Washington Spirit) hits the right post with a right footed shot from the centre of the box following a corner. Attempt saved. Taylor Lytle (Sky Blue) right footed shot from the right side of the box is saved in the centre of the goal. Assisted by Samantha Kerr with a through ball. Dominique Richardson (Sky Blue) wins a free kick in the defensive half.